The Sonologyst is a sound explorer with a certain passion most other sound explorers can glorify. We heard his ‘unexplained sounds’ release in which Sonologyst went deep into unexplained sounds that appear world-wide and molded it in a researchful way in to its very own music. But what happens when Sonologyst doesn’t use the bizarre sounds as a source for music but for example a commonly used instrument like a guitar? 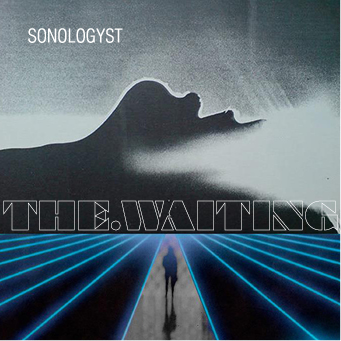 That’s what this release ‘the waiting’ is basically all about. It starts with a pleasant track named ‘Before the waiting – Electric Guitar indication 1’ which features indeed the distinctive sound of a guitar but not played like most guitar players would play the instrument. The Sonologyst is not playing melodies or strumming away but rather uses the guitar as a sound source that is ticked upon. With each and every improvised hit the listeners can enjoy the acoustics of this instrument singing its own tones in a warmth environmental flow of air that the artist had prepared for the special experimentations. It might be a scientific approach of playing such a instrument but to my ears it is very relaxing and a (most importantly) listenable soundtrack. The second track ‘9.743,5 km (feat. Usui Yasuhiro)’ seems to combine the pure sound exploring approach of the Sonologyst while also having the guitar being played in a possible way that the inventors of this instrument had in mind at the times of creation. The combination of the scientific audiophile approach and the more traditional play style creates a interesting avant-garde piece that is a bit like listening to a contrast of a Beauty and the beast with additional warmth to make it also enjoyable for people that just want to hear something to chill out with or indeed can be at the same time used as a audio based scientific instrumental engaging work with ideas and experimentation. The track named ‘ The waiting – Electric guitar indication 2’ is what interests me personally the most. Here the concept of a normal played guitar completely loses it’s own identity and transforms into what my ears could only describe as a experimental composition of the guitar sound being shaped as a violin, the hammer of the inside of a piano and at times indeed a guitar on its own. The violin sound coming out of the guitar is impressive and is strangely something that had never crossed my mind that a guitar could be twisted enough to be something so different than its own. A ambient soundscape named ‘Phoenix’ is solidly using the guitar in multiple ways to expand the horizon of guitar use. Fingers slide over the strings to substation a pleasant backdrop for the other subtracted guitar sounds that the Sonologyst spreads out for a warm romance of pleasant ambience. The one named ‘Red shift’ brings small mysterious guitar snippets that are popping up to form a collage that together mold into a cinematographic audio work. It’s dark and hot and would be great to be heard while imagining a picture of a red colored desert with sandy hills and slight glitchy disturbance that fits a slow encounter of a U.F.O. The last track ‘Resolution – Electric guitar indication 3’ features what sounds like stretched out guitar tones that form a warm simple progression that comes across as a soft blanket to sleep under. This entry was posted in acoustic, ambient, audio collage, avantgarde, chill out, experimental, soundscape and tagged ambient, experimental, guitar improvisation. Bookmark the permalink.